Photo: Matthew Murphy The Band's Visit, a new musical that celebrates the deeply human ways music and laughter connect us, opened in November to rave reviews at the Barrymore Theatre on Broadway. It is the story of the Alexandria Ceremonial Police Orchestra's arrival in Israel for the opening of an Arab Cultural Center, only to find out that they have boarded the wrong bus to the wrong town—with some inevitably amusing consequences. A big part of the musical's success is celebrated sound designer Kai Harada's innovative sound design, at the heart of which is Astro Spatial Audio's true object-based approach to immersive, three-dimensional audio. Harada recounted how he first became aware of Astro Spatial Audio's creative possibilities: "I have known (Astro Spatial Audio director) Bjorn van Munster for a number of years, and although I had heard about the system, it was only last year that I saw and heard a demo of the system in California. A few years ago, I had used a competitor's system on a Broadway show that required precise localization, and then last year I found myself designing The Band's Visit, which would require the same precision, and I thought it would be a perfect chance to try the Astro Spatial Audio system." At the heart of the Astro Spatial Audio (ASA) solution is the conversion of audio signals into audio objects. ASA's SARA II Premium Rendering Engine—a 3U road- and rack-ready processor offering up to 128 MADI or 128 Dante-configurable network pathways at 48kHz/24-bit resolution—utilizes extensive metadata attached to each audio object. The result is a precise calculation of that object's position within virtual 3D space, processed in real time up to 40 times per second for each individual object, as well as that object's acoustic effect on the virtual space around it. The result for the engineer is a truly three-dimensional audio canvas on which to play. 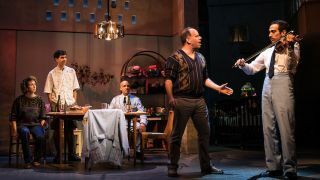 "In The Band's Visit, several musicians play their instruments in a variety of locations on the stage, and it was incredibly important to me to preserve a transparent sound system design—in my opinion, the more we attracted attention to the sound system, the less the audience would connect with the actors and the story on stage, so natural-sounding reinforcement was the goal,” Harada said. It quickly became apparent that the system was easy to set up: Harada's associate, Josh Millican, drafted all the speaker positions in CAD, and when it was time to commission the system in SARA II the measurements were verified and the values simply entered. "ASA allowed us to precisely place the instrument source as an audio object within a graphical interface, while it did all the calculations to make it sound correct. Changes to staging were easily accommodated. In addition, having used other acoustic enhancement systems on other shows, I was eager to try the ASA room enhancement to give the illusion that the theatre was a larger acoustic space for some key moments in the show. "Also, there were a number of very localized sound effects—coming from a prop radio, or a jukebox, or a baby—and although we had many wireless loudspeaker systems to play with, we used SARA II to reinforce the localization through the main PA: the initial waveform comes from the practical loudspeaker, but SARA II ensures that the sound is localized correctly for all audience members." The production is configured with 162 mono inputs and 24 stereo inputs—which comprise a cast of 15 performers, four musicians that play in a purpose-built room under the stage, the five additional stage musicians (who also play in the room when they are not on stage)—totaling 68 band inputs, 26 playback (QLab) inputs, 36 SARA II returns into the console, and a host of reverb returns and utility channels. Reflecting the fact the Astro Spatial Audio is entirely brand agnostic, 90 percent of the loudspeakers used in the show are from Meyer Sound (M1D, LINA, UPJ-1P, UPJr, UPQ-1P, MM4, UPM-1P, UMS-1P, UPA-2P), with the rest from d&b audiotechnik with E5s as surrounds. "The ASA system is not tied to any one loudspeaker brand," said Bjorn Van Munster. "We believe it is in the best interests of the market that Astro Spatial Audio remains brand independent. Users should benefit from object-based immersive audio regardless of which loudspeaker they invest in. Similarly, we support a range of protocols, including MADI and Dante, and we intend to continue working closely with our good friends in the industry to bring our technology to as many people as possible, and to create incredible experiences for audiences everywhere." While automation is a key feature of the ASA immersive solution, the system is equally focused on allowing the audio operator limitless creativity in a live environment. "The show is mixed manually," Harada said. "My operator, Liz Coleman, mixes every word, line by line, and helps augment the dynamics of both the stage musicians and the musicians in the trap room. The console's automation helps out by grouping inputs in logical ways, but Liz is very much performing along with the musicians. Nothing is on timecode on our end; sound effects are triggered manually by Liz, sometimes based on a visual cue, sometimes on a musical cue. All commands to the SARA II system are also triggered by Liz." ASA's ultimate purpose is of course enhanced audience enjoyment. "The goal was not merely an immersive audio experience; the goal was a ‘transparent’ audio experience, and I think we were very successful," Harada said. "Many people have commented about the quality of the audio on the show, and I am quite proud of it. I do believe we have achieved our goal of creating an intimate, organic-sounding show but still delivering dynamics when appropriate. The story is so human and conversational that we needed to preserve that feeling but still ensure that everyone in the audience had a very good aural experience. "The localization algorithms helped create a very natural-sounding reinforcement system also for the musicians onstage,” Harada said. “I did appreciate the room acoustic enhancement feature as well, although I chose to use it sparingly and subtlely, and only when dramatically appropriate for the piece. Most theaters I get to work in already have an acoustic—some of them, like at the Barrymore Theatre, are quite nice, so it was never my intent to fight the acoustic, just to augment it. “I think [ASA] is a great tool: it is quick to set up and commission the system, which is very important in an industry where time is very, very expensive. Having what are essentially two separate features: object-oriented audio and acoustic enhancement in one box is a great boon. Not having to manually calculate delay times to a given reference point was also a huge time-saver; just entering the x, y, z coordinates of the loudspeakers got us very close to having a functioning system in a short amount of time, and then we could spend the rest of the time listening and adjusting. "Without the functionality of the ASA system, the sound of the The Band's Visit would have remained two-dimensional. I'm extremely pleased with the results. I am eager to find another show that would lend itself to using Astro Spatial Audio."